The Leutholds have tasked winemaker Richard Batchelor with becoming the Northwest’s leading producer of Viognier, and the 2017 represents the largest bottling of this white Rhone variety in Washington. They branched out beyond their estate Gunkel Vineyard near the winery and Tudor Hills Vineyard in the Yakima Valley to expand their work with the Horse Heaven Hills with Coyote Canyon Vineyard and McKinley Springs, both farmed by members of the Andrews clan. Aromas of pear, peach and ripe banana, mixed with a palate of tropical fruit, including sweet pineapple. This is a full-bodied white, soft and velvety thanks in part to partial fermentation on French oak. Its background acidity prevents flabbiness, offering gorgeous balance and brightness. 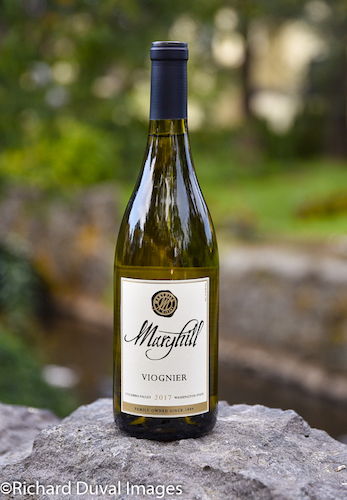 Maryhill has increased its Viognier production by more than 30 percent since 2013, and yet its 2017 example emerged as best of class at last fall’s Great Northwest Invitational Wine Competition.